Novomatic’s Gold Runner brings nostalgia to your screen. Playing this game will transport you back in time. Although it’s a new online slot game made for online casinos, it looks like it could be 50 years old! The design of this slot makes it look like it’s an actual slot machine! You can zoom in to see the reels and the settings/payouts more clearly, or you can zoom out. When the game is zoomed out, you can see the Gold Runner slot machine in all its glory. The front screen and the panel look so realistic. The same goes for the background, which is a vintage-style casino! Plenty of other Novomatic slot machines can be seen in the background, including: Simply Wild, Random Runner and Club 2000 Casino. The lighting and the carpet inside this casino look dodgy enough for it to have been built in the 70s! As for the game itself, it might look complicated but it’s actually very simple and easy to understand once you start playing. You can play the game many different ways, so it’s all about your personal preference. Gold Runner can be played on 5 paylines, 10 paylines, 15 paylines or 20 paylines, across 3, 4, 7 or 8 reels. The 8 reels are split into two sets of 4 (one on top of the other). They both has four reels with three rows. If you play with 5 paylines across 3 reels, you’ll play on the bottom set of reels and the rightmost reel will be unlit. If you play 10 paylines across 4 reels, you’ll play on the entire bottom set of reels. Similarly, if you play 15 paylines across 7 reels, you’ll play on the entire bottom set of reels, plus the top set of reels, without the rightmost reel on the top set. When you play the game with 20 paylines across 8 reels, you’ll play on all the reels (entire top and bottom sets). Gold Runner is a game that’s played in coins. 5 paylines + 3 reels = 5-coin bet. 10 paylines + 4 reels = 10-coin bet. 15 paylines + 7 reels = 15-coin bet. 20 paylines + 8 reels = 20-coin bet. You can customise the coin value as well, from 0.01 to 2.00. So, the minimum bet possible is 0.05 (0.01 coin value x 5-coin bet). Gold Runner has 9 symbols in total. If you’ve ever played slots before in your life, you’ll surely recognise all of the symbols! In fact, even if you’re a total newbie, you’ll know that these symbols are associated with slot machines. They’ve been turning up on the reels of slot games for decades and have become synonymous with slot machines the world over! There are four low-paying symbols, four medium-paying symbols and one high-paying symbols. The four lowest-paying symbols are: the orange, the plum, the pear and the golden bell. The four medium-paying symbols are: the strawberry, the grapes, the watermelon and the red seven. The highest-paying symbol is the star symbol (blue and white). This last symbol doesn’t actually show up on the reels as a symbol, instead it appears on the other symbols. Any symbol with a star symbol on it (any of the fruits, the gold bell or the red seven), will be considered a star symbol and will give wins even when the symbols themselves don’t match (as long as they land in the right positions and all have stars on them). All symbols have three-match payouts. Payouts are awarded when the three matching symbols (whichever symbol) land on consecutive reels and follow a payline. All paylines pay from the left towards the right and you can see the paths they take outlined on the reels. 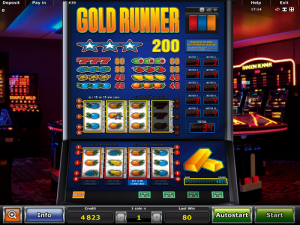 Gold Runner is a slot game that’s made by the famous Novomatic! Here, on our site NovomaticCasino.co.uk, you can play it for fun! Our recommended Novomatic Casinos are great for if you want to play Gold Runner for real money. This slot doesn’t have Novomatic’s classic gamble game but you can play Gold Runner in auto mode (by turning on autoplay).